The final RTM version of Windows 8 has been cracked. 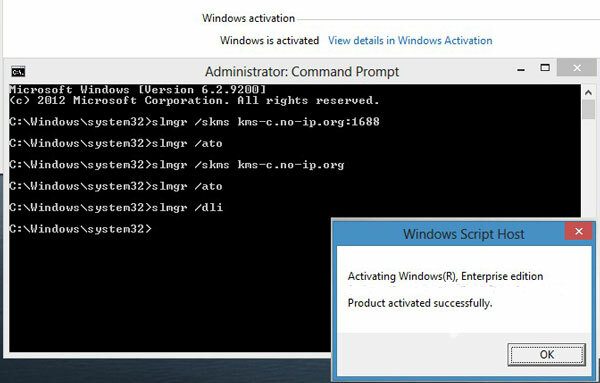 Windows 8 activation can be done through KMS activation hack which has previously been used to activate Windows Vista and Windows 7 has been proven to work on Windows 8 too, although only on installations of volume licensing channel. KMS activation crack had not been popularly used in the past to activate Windows Vista and Windows 7 as it’s outshone by OEM activation hack which performs instant one-time Windows activation offline without the need to setup any additional host. The OA3.0 in where all OEM computers running Windows 8 now required online activation has made OEM activation much harder to hack, at least until actual machines preinstalled with Windows 8 shipped. As mentioned, Windows 8 KMS activation crack is nothing new. In fact, it’s an old trick by applying the KMS server with KB2691586 and an valid Windows 8 KMS host key. Currently, there is no valid Windows 8 KMS host key been leaked yet, preventing creation of own KMS host. In addition, as KMS is only used by Microsoft clients who purchase volume licensing agreement, so only Windows 8 Enterprise and Windows 8 Professional can be activated via KMS, provided they’re installed with a VLK (volume licensing product key). Windows 8 activated with KMS server can be used genuinely for 180 days, allowing all personalization and full features, although it’s still an unknown if the system can pass the genuine Windows validation. After 180 days, the Windows 8 system will need to check against a KMS host to maintain the activated status. Without activation, Windows 8 runs in “notification mode” where notification watermark appears every 3 hours to remind user to activate the system, and with restricted functionality especially those that related to personalization.